Shopping for a new Cadillac CTS-V? Though packing almost every other performance option in the book, the Cadillac CTS-V’s steel brakes leave us wishing for a carbon ceramic option, especially on track days. The 2019 Cadillac CTS-V is arguably the greatest American performance sedan ever, and we will miss it dearly when it's discontinued after 2019. The 2019 Cadillac CTS-V is a swan song for one of the greatest American performance cars ever. With a mountain of power, sharp sport sedan handling, and plenty of refinement, this is a bona-fide competitor to the best the Germans have to offer, and for that it should warrant a score much higher than 6.3 out of 10 overall. For 2019, the CTS-V is available in a new Pedestal Edition package to send it off for its final model year, complete with carbon fiber accents, Recaro seats, red brake calipers, and every bit of tech the CTS-V has to offer, not to mention a package-exclusive Bronze Sand Metallic paint color. A supercharged 6.2-liter V-8 is the heart of the beast, making a whopping 640 horsepower sent exclusively to the rear wheels. With a 0-60 mph time of just 3.7 seconds and a top speed of 200 mph, this normally septuagenarian four-door sports supercar numbers. The garden variety CTS is a solid car to start with, complete with impressive technology, a comfortable interior, and sharp looks. The CTS-V dials everything up to 11, featuring heavily-bolstered Alcantara-accented seats, fender flares, big intake vents, and a rear lip spoiler, not to mention massive wheels and brakes. The 2019 Cadillac CTS-V makes the case that every already good-looking car looks better with fender flares and more vents. 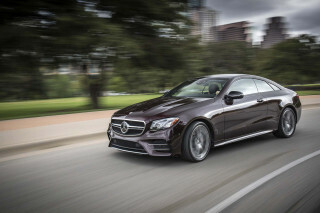 If its big vents, fender flares, and optional carbon fiber trim pieces weren’t enough to tip you off, a host of blacked-out trim pieces and massive wheels should make it pretty clear that this is no ordinary luxury sedan. The CTS-V shows its age in some ways, but it still looks lean and mean next to its curvier (and more reserved) competitors. Inside, a last-generation interior still holds up to snuff thanks to big bolstered seats, faux suede accents throughout, and just the right number of racy accents like contrast stitching. You won’t feel as coddled as in a Mercedes or BMW, but the CTS-V does a convincing super-sport luxury sedan impression and feels every bit worth the money, especially considering it comes at a significant discount over its two German rivals. The 2019 Cadillac CTS-V wields its 640-horsepower hammer of an engine with the ease of Thor. The beating heart of the CTS-V is a 6.2-liter supercharged V-8 sources from the Chevrolet Corvette Z06 and slightly re-tuned to make the most of its power in sedan form. That massive powerplant makes 60 mph possible from a standstill in just 3.7 seconds and pushes the top speed to 200 mph, numbers that some supercars have a hard time reaching. An 8-speed automatic transmission and rear-wheel-drive are the only powertrain options, but the “slushbox” manages quick shifts and has heavy-duty components to extend its longevity after miles of hard driving. Of course, this isn’t just a massive engine shoehorned into a normal family sedan like American V-8s of yore. The CTS-V is 20-percent stiffer than the standard car through shock tower bracing and more, and the Michelin Pilot Super Sport tires are set on staggered-width wheels (9.5 inches in front and 10.5 inches in the rear) to put down as much power to the pavement as possible. An electric steering rack from ZF helps make the CTS-V a surprisingly good corner carver, with responsive moves and sprightly handling. Adaptive magnetic dampers provide a better ride quality than expected in relaxed driving, but when on the track, they’re close to unmatched in capability. The only immediate area where the CTS-V could improve is in the braking department, though that’s unlikely to happen as this is the sedan’s final model year. Standard Brembo steel brakes are the only option and they experience considerable fade after a day at the track. Some carbon ceramic rotors would be a welcome addition for track days. The 2019 Cadillac CTS-V is spacious and finished with luxurious materials. From optional Recaro seats to Alcantara accents and contrasting stitching, the CTS-V hits all the right sports sedan marks, though its back seat leaves some room for improvement for taller passengers (literally). 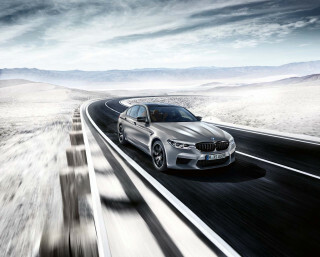 High-end options like a Bose stereo and a performance data recorder with a video camera to shoot your hot laps make for a high-end experience, but it lacks the prestige that other more expensive (and newer) competitors like the BMW M5 and Mercedes-AMG E63 boast. Middling crash test scores and a lack of optional equipment hurt the 2019 Cadillac CTS-V’s safety rating. The 2019 Cadillac CTS-V shares most of its parts with the regular CTS and is therefore equally disappointing on our safety scale. We expect more from a luxury brand. A four-star overall rating from the federal government is troubling, and the IIHS’s ratings back this up with “Marginal” score for the driver-side small front overlap and a “Poor” rating for the headlights. 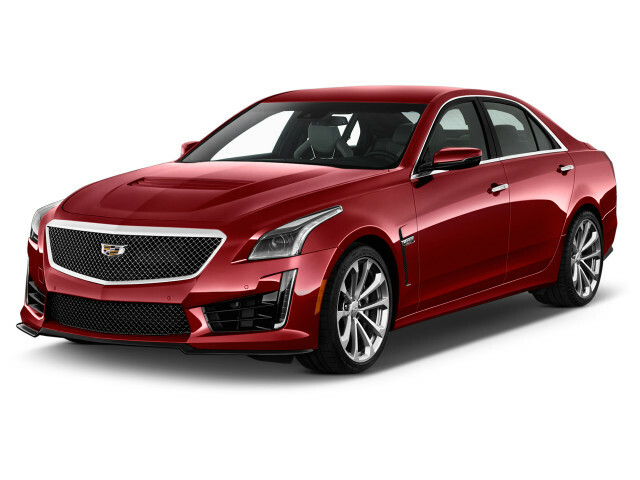 While the standard CTS does offer automatic emergency braking and forward collision warning, the V does without the former as it’s unable to squeeze the sensors necessary into the grille with all that real estate needed for engine cooling. The 2019 Cadillac CTS-V checks all the super sport sedan boxes at a significant discount over competitors. The CTS-V features an 8.0-inch infotainment touchscreen with Apple CarPlay and Android Auto compatibility, not to mention available 4G LTE wi-fi (with a monthly fee) and a Bose audio system all as standard. A built-in Performance Data Recorder is available that records HD video laps with all the pertinent data needed to analyze driving performance. Drivers can check throttle percentages, brake temperatures, lateral G’s, and even map the track by GPS and play it all back for themselves (or their YouTube friends) later. Other high-tech features like the rear-mirror camera are present too, which lets you switch the center-mounted rearview mirror between a regular mirror and a wide-angle video feed of the rear of the car. Considering its base price has five digits instead of six, the CTS-V is a relative bargain compared to its German rivals, both of which start at over $100,000. Its only demerit is that it lacks advanced safety gear. With a supercharged V-8 under the hood, let’s just say gas mileage isn’t the 2019 Cadillac CTS-V’s strong suit. The 6.2-liter supercharged V-8 earns 14 mpg city, 21 highway, and 16 combined according to the EPA, and requires premium fuel for maximum performance and longevity of the engine. Looking for a different year of the Cadillac CTS-V?